Are you wondering how you should be using turmeric in your face packs to cater to the needs of your specific skin type? As an Indian, you need not worry about laying your hands on some good quality turmeric since it is profusely available in the markets. Whether you want it in the powder form or in the root form, it is there for you ready at hand. You just need to be creative enough to mix it with other useful ingredients to prepare the right kind of face pack so that you look more beautiful than ever before. • Mix two spoons of gram flour with curd and add a bit of turmeric in it. Apply it on your face. Once it is partially dry, start scrubbing in circular motion. While yoghurt helps to improve your complexion, turmeric assists in fighting against pimples and acne that are common problems for people having oily skin. When you use it as a scrubber as well, the mask is effective in removing dead cells too. • Mix two spoons of sandalwood powder, few drops of lemon juice and two spoons of milk with a pinch of turmeric. Apply it on your face and neck. Let it dry and then rinse thoroughly with lukewarm water. The pack is effective in alleviating oily skin. • Mix one egg-white with a few drops of lemon juice, rose water and olive oil. Add a pinch of turmeric and apply it on your face. If your knees and elbows feel dry, you can apply the paste on these areas as well. Let the pack dry completely and rinse with warm water. This would help in alleviating dry skin conditions. • Take a spoon of thick milk cream and add half a spoon of rosewater to it. Add a pinch of turmeric and allow the paste to stay on your skin for two hours to get the best results. Regular application of this paste would impart glow to dry and dull skin. • Mix pureed mint (one spoon), milk (two spoons), honey (one spoon) and turmeric powder (1/2 spoon) to make a fine paste. Apply it on your face and rest for twenty minutes. The pack can be used everyday. While turmeric and milk add glow to skin, honey and mint are effective in soothing sensitive skin. • Mix turmeric paste with jojoba oil and apply it on your face. Rest awhile and wash with cold water. Mix four teaspoons of curd with one teaspoon of turmeric. Apply it on your face and neck; leave it for about twenty minutes. When it is dry, wash it off thoroughly with cold water. Take one spoon of turmeric; mix it with thirty or thirty-five fresh neem leaves and five drops of neem oil in a blender. Both neem and turmeric are endowed with anti-bacterial and anti-fungal properties which would allow you to treat acnes, pimples and scars successfully. • It is advised that you add only a little bit of turmeric in your face packs as turmeric often tends to leave a yellowish stain on the skin. 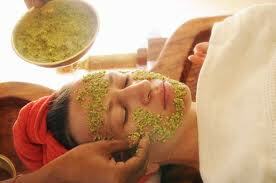 • Wear an old t-shirt while applying the face packs so that you do not have to lament it if you happen to spill your face pack on your favorite clothes; turmeric leaves stains on fabric as well. • Apply turmeric packs when you plan to stay at home for quite sometime; you might not like to move out in the public with a yellowish face. • Do not worry about the stains the face packs might leave; they would fade in sometime. You just need to be a bit patient. Gud mrng to all. Nice post somreeta. ya me too..chandan with rose water works well for oily/combo skin..but having said that I bought the TBS face pack recently.its called the Seaweed Ionic Clay mask meant specifically for oily/combo skin..its 895 bucks. used it once so far and my face didnt break out into pimples so keeping fingers crossed 🙂 if anyone has used this, lemme know.. but till then turmeric face packs etc will always be a fantastic option. i read abt 1 turmeric brand… i cant remm the name, it doesnt leave yellow color, used for brides, pure turmeric.. we get it in blore… can any1 say the name ??? Once i had applied turmeric to my face & got scared with so much of yellow tint on face. So I poured some milk on my face & the yellow tint Easily went.